First telltale sign of a great restaurant is the crusty van that pulls up full of hand-foraged mushrooms. Every time I see our mushroom guy pull up at Salty’s, I get butterflies in the pit of my stomach like the first time I asked a girl to dance. These mushrooms are hand foraged which means they are not farmed and are picked by wandering through the woods. Many varieties of mushrooms come from our forests in the Pacific Northwest and they have some crazy names. The varieties you might see around are fried chicken, lobster, delicious milkcap, bear’s head tooth and hawks wing. Yes, these are all mushrooms and not superheroes. Today I want to go over the most common of the foraged mushrooms, the chanterelle. The chanterelle mushroom is a staple on every fall menu and adds richness to any stew or steak dish. Chanterelle mushrooms have a nice fruity aroma with a wonderful peppery finish. 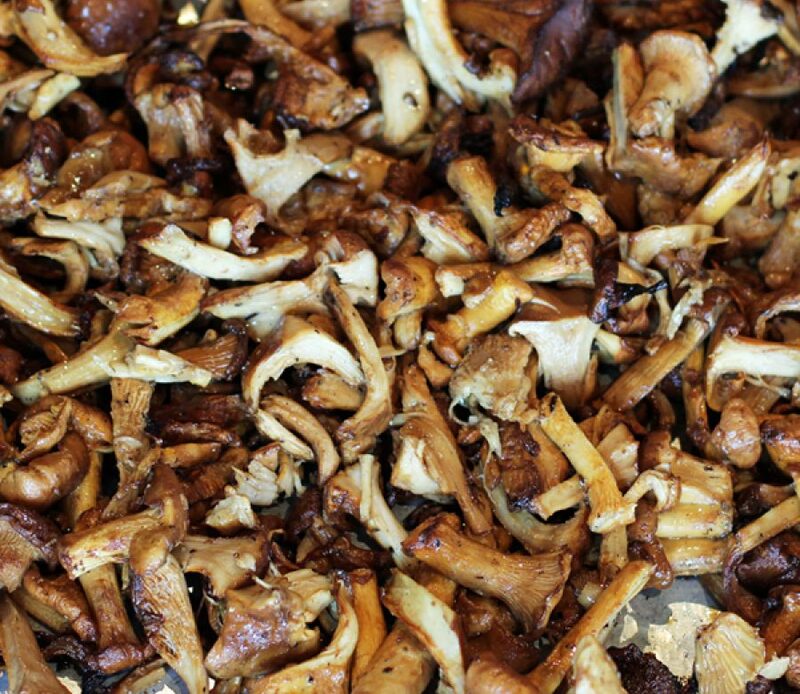 Here are tips on how to buy and cook these amazing fungi. My first choice to buy any mushrooms for home cooking is Foraged and Found. Second choice is a natural market like PCC, Metropolitan or Natures. When buying chanterelles you want to make sure the mushrooms are dry and relatively clean. Chanterelles grow near pine trees so they traditionally have a ton of pine needles in the tops. You will want to clean the mushrooms with a dry pastry brush or a dry towel. Do not rinse the mushrooms because they are little sponges and soak up water quickly. Mushrooms carry a ton of water so I like to cook them hot and fast. Kind of like my first dance with a girl! I toss the mushrooms in olive oil with salt and pepper and then lay them flat on a cookie sheet. Next I roast them in the oven at 450 degrees until they crisp slightly. Now you can add them to steaks, salads, starches or dips. You’ll also want to read Kathy Kingen’s blog Chef’s Treasure about how mushrooms are a food to be revered including nutritionally. And check out Salty’s “Aw Shucks” Bivalves Festival dish Local Oyster Stew with bourbon-braised leek cream, chanterelle mushrooms and Yukon potatoes. You can be sure that among us at Salty’s we all love fungus.